We already shared our research findings about the importance of the Venus cycle and long lasting marriages. We analyzed 132 marriage dates of the longest marriages ever and compared these with a data-set of 175 marriage dates that ended in divorce. Even though the data-sets are insufficient to build a theory on, some research results already come out significantly and that's why we want to give you some insight in our preliminary findings. When investigating all the possible minor and major astrological aspects between the planets, bodies and points with different orbs, the Venus-Mars aspects in the marriage horoscopes triggered our interest because there were some highly significant things going on here. Look at the graph below that shows the different aspects analyzed between Venus and Mars. The Green bars show the aspects found in the long-lasting marriages while the orange-red lines show the aspects found in the marriage charts that ended in divorce. Surprisingly and contrary to common belief among astrologers, the Venus-Mars squares are more often found in the marriage horoscopes of lasting marriages. One would expect this aspect to be more prevalent in marriage charts ending in divorce. But what struck us most is the Venus-Mars semi-square (aspect of 45°)! 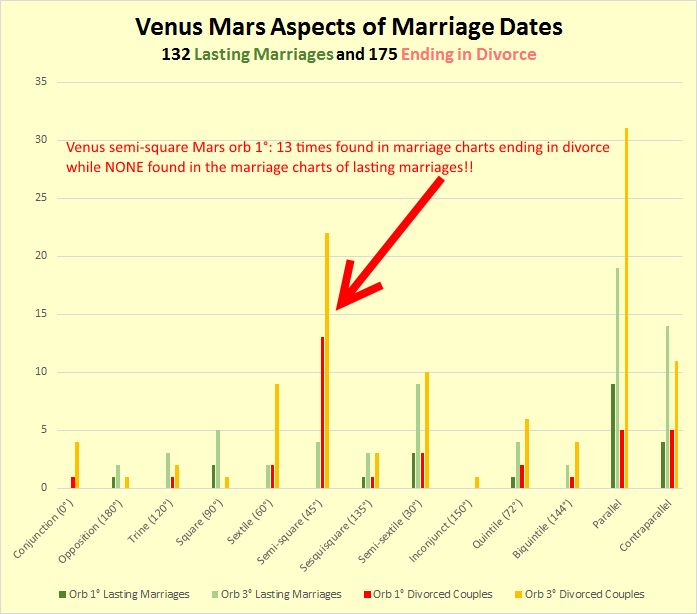 Take a look at the graph; a HUGE number of marriage charts that ended in divorce have a Venus-Mars semi-square! Clearly, it looks like the Venus-Mars semi-square in a marriage horoscope may be a real marriage-killing aspect. It does not matter if you take a 1° or 3° orb into account (though we always love to work with tighter orbs). The aspect with a 1° orb was even not found in the marriage horoscopes of long-lasting marriages at all. Also, not a single conjunction was found in the marriage horoscopes of long-lasting marriages. So, our preliminary conclusion would be: avoid the Venus-Mars conjunction and semi-square in the marriage horoscope if you want to give your marriage a chance! Divorce Horoscopes: When Is Love Over?